The principled approach to using technology in the language classroom is one where teachers are encouraged to ask themselves a series of questions before using technology in their lessons. The term was coined by Nicky Hockly, who has written two blog posts (The principled approach 1 and The principled approach 2) and an article in the Journal of Technology for ELT about the need for teachers to think carefully before integrating technology into their classroom practice. 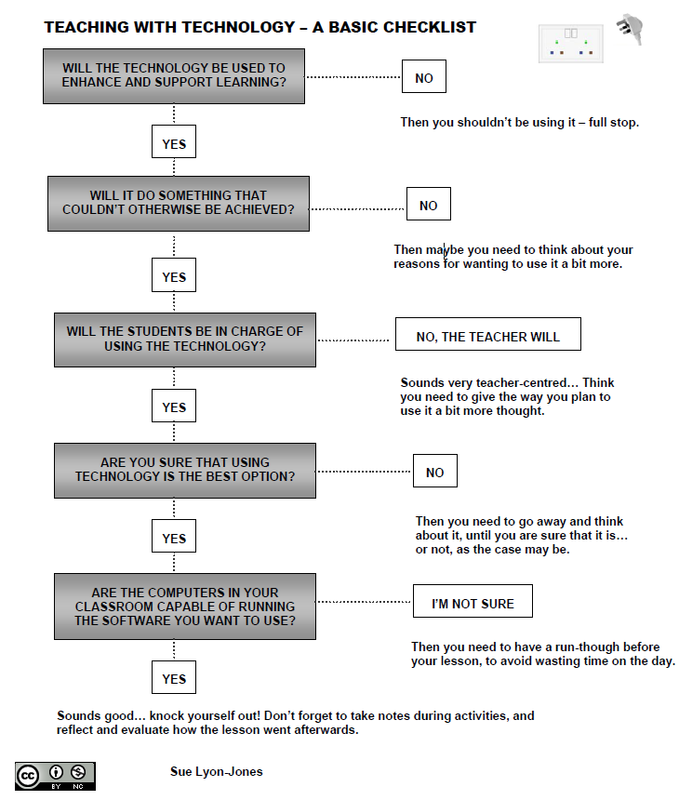 I first wrote about this in May 2011 and included a very useful flowchart produced by Sue Lyon-Jones, which I’ve reproduced below. It’s also something I kept at the forefront of mind when writing the handbook Language Learning with Technology. In the handbook, I’ve expanded on my original ideas in the introduction as I think this principled approach is one that will counter much of the criticism of the use of technology for technology’s sake in language teaching. All teachers with an interest in learning technologies finds themselves tempted to try out new tools with learners, and I don’t think there’s anything wrong with this so long as teachers follow a principled approach to integrating the technology. What do you think? Download PDF of sample content from this book chapter from Cambridge English here.